Want to make your stay in KYOTO more memorable? If so, why not visit our calligraphy class? Let's turn vocabulary words into beautiful works of art! There are a lot of advantages of learning calligraphy. 1. Your posture will be better. 2. Doing calligraphy gives you a healing effect and it becomes a great stress reliever. 3. This experience will be your lifelong memory for you. 4. Writing beautiful letters means the person is smart and classy. The most important thing is to enjoy new culture. PAPA will give you a clear and easy instruction. Please feel free to contact us at any time if you are interested in this class. ◆We will give you FUDEPEN (Japanese pen for calligraphy with a tip like a brush) and a spare cartridges of ink. After October 1, 2018, we will charge the accommodation tax separately from the accommodation fee. 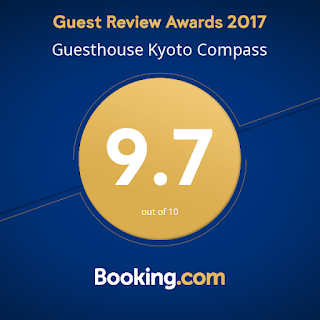 a wonderful award of Booking.com. We got a wonderful award of Booking.com. We feel honored of that. Thanks to everyone, your review made this point. It is a great present to us. 7 reasons why you should stay at COMPASS. 1. Caring staffs will always take care of you. 2. We always take it easy. 3. You can make friends naturally. So you never feel alone. 4. Not stylish, but like grandma's home. If it is super stylish, you can not be in a relaxed mood, right? 5. We will help anything to make your stay wonderful! But our knowledge is limited, such a time, let's look up it together. 6. You can feel non touristic and local atmosphere. There are public bath houses, very typical IZAKAYA(Japanese style pub) and many local restaurants, so you can feel the local atmosphere. 7. MAMA, she sums up everything. Speaking of COMPASS, it is MAMA. Speaking of MAMA, it is COMPASS. Not only MAMA, but also there are Handsome PAPA who is very good at calligraphy, beautiful AKANE(if she keeps quiet,haha) and me COCO who loves mountain hiking and drinking. "Seeing is better than hearing"
Do not miss COMPASS, it will be the best part of your memory in your journey. You wanted to be alone on your journey... Mission Impossible!! Have you ever been to see the autumn leaves? Kyoto is really famous for that. 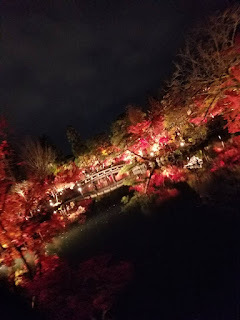 I went to Eikando-Temple tonight. There is a garden within these grounds in which special night visits are held in autumn. 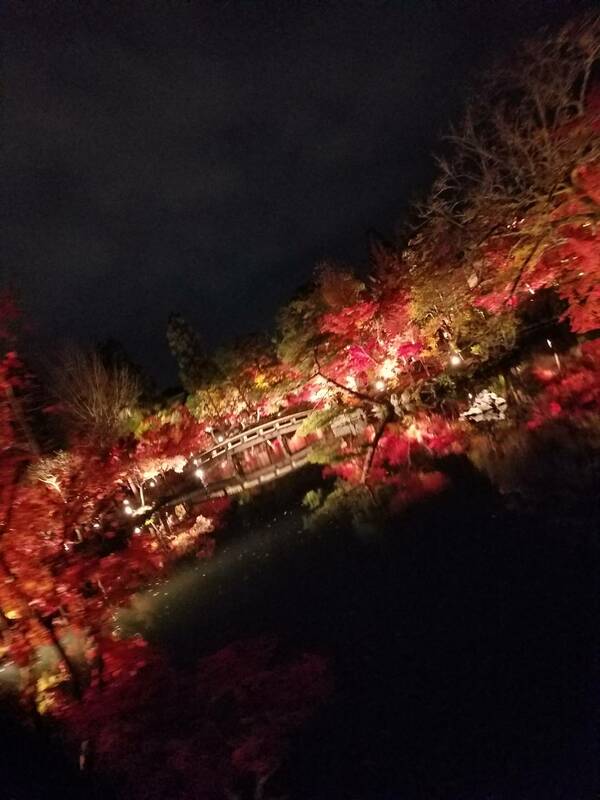 The leaves have a beautiful contrast between red and green. It's cold outside make sure you wrap up when you go there. 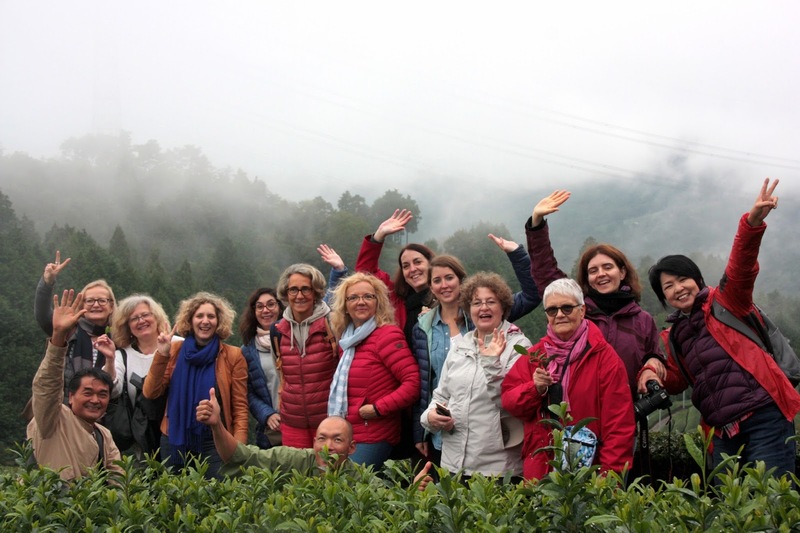 Fantastic Japanese Tea Tour !! Our guests are 11 Belgium ladies. They learn Japanese culture so well and curious about Japanese tea. 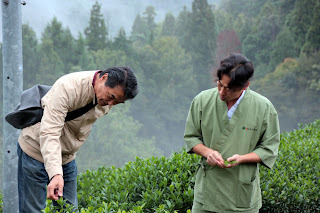 They made a reservation Tea tour with KYOTO OBUBU TEA FARM in WATSUKA in KYOTO. 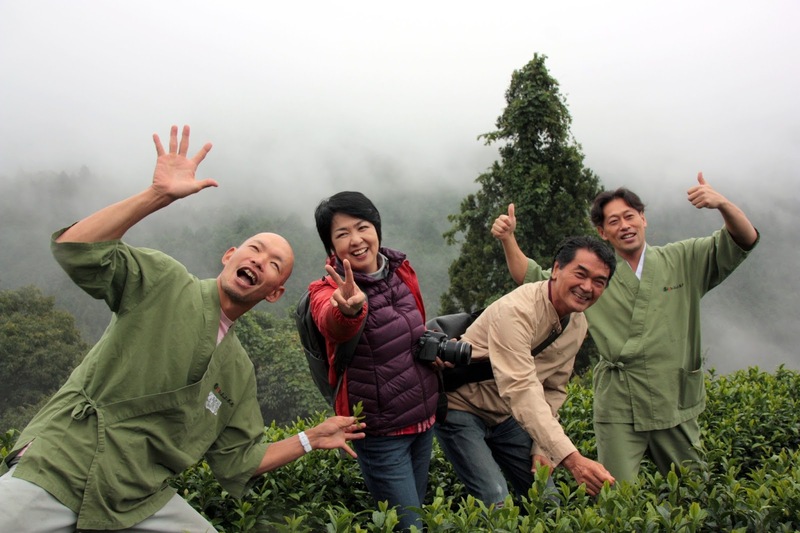 We joined their Japanese tea tour together. The OBUBU FARMS is in WATSUKA in Kyoto. 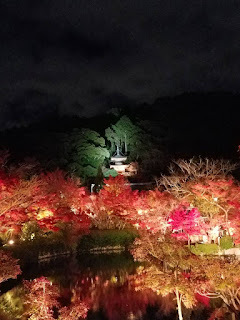 It takes about more than 1 hours from the center of Kyoto. 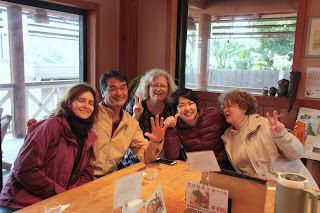 Kyoto obubu tea farms were welcoming , warm atmosphere. We met three Japanese staff and four foreign interns, an italian, a french, an Australian and a chinese. All of them were so friendly and so funny !! They explain what is green tea and what different with other tea with screen in English. We saw and drank a couple kind of tea and listen about tea. Our guests were so serious, they asked many questions. I'm Japanese but I don't know about tea very much. Next, let's go to the farm !! It was rainy day, but our guests didn't care about the rain at all !! But the tea plantation was made along the face of mountain. You have to claim on the maddy way. Look !! It is awesome view, beautiful !!!!! Hiro ( one of the staff), he explain the plantation and gave tea flower to our guests. 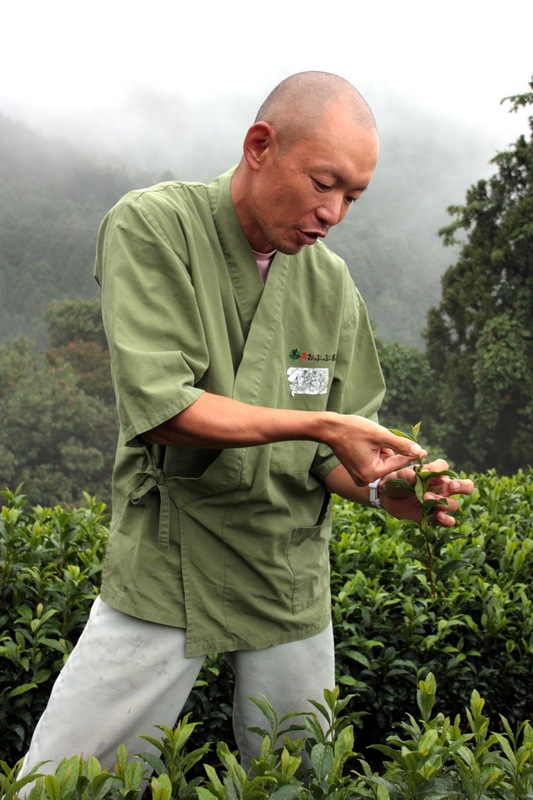 Aki (the owner)told us how to pick up tea leaves. We tried picking the leaves. Next, we went to the factory to know how to make tea. The four intern told us how to use a machine and process. After the lunch, we studied again. We practice to offer the tea. If you'd like to buy the tea of WATSUKA, you can buy them after the schooling. If you curious the tea tour, look their web site. We joined "ENCHANTED TIME WITH MAIKO"
We, Papa & Mama went to Gion and experienced the party with MAIKO. It was the first time to see a MAIKO so close. The reutaurant is Yasaka-dori EMRAKU. The MAIKO was dancing 2 songs. The food course is Kyoto cuisine. It was delicious. While you are eating, The MAIKO visiting around table to you !! You can ask her anything !! We know MAIKO but we tend not to know the life of MAIKO. Let's make clear your question !! You play 2 game with MAIKO. The game was so simple, but it was fun because being with MAIKO!! The location was so good atmosphere. If you are interesting about it or You'd like to make a reservation, please contact us. Please look at the site detail.